The power of values arises from the fact that they help us transcend ourselves. Values are what we consider valuable. Placing any ideal of perfection above our own personal convenience and interests expands our personality and opens it to wider and higher influences. The pursuit of higher values is the pursuit of spiritual Truth. The expression of higher values is to bring Truth down into one's life. When we examine the lives of famous people, we often see how personal values guided them, propelling them to the top of their fields. For example, one actor was motivated by his commitment to social justice, which led to important acting roles related to that value that made him world famous. Likewise, a well-known business CEO was motivated by the personal value that technology should be easy to use, which caused his company to spawn a technology revolution. Whatever one's values, when we take them to heart and implement them in the smallest details of our lives, great accomplishment and success are sure to follow. Likewise, we see how political parities and politicians subscribe to certain core values -- ranging from helping the poor, easing the burden of the middle class, improving the environment, making government responsive and efficient, engendering loyalty and unity, and so forth. The key point to keep in mind about values is that implementing them energizes everything concerned with it. For an individual, committing to and applying values releases fresh energies, which always attract success, achievement, and well-being. Likewise, when companies or other institutions adopt values, individuals working at the organization become energized, as do its customers, its products and services, and everyone and everything else associated with that organization. We can energize our lives by making the full effort to implement the values we subscribe to. Once we identify values that are meaningful to us, we can develop strategies to implement them. When we make the determined effort to implement those strategies, good fortune it sure to follow -- in the form of new opportunities, new sources of revenue and income, and other forms of material and psychological benefit. We may even notice that as we implement values, we experience instances of Life response-- where good fortune suddenly comes to us from seemingly out of nowhere, defying our normal perceptions of what is logical and possible. 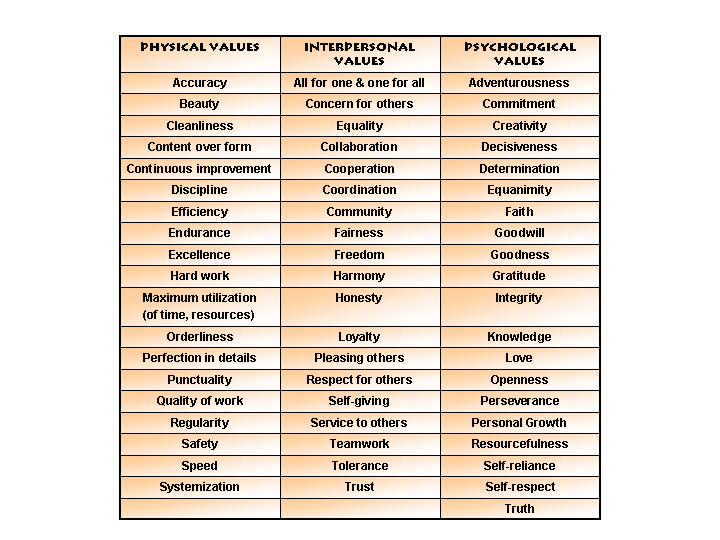 Below you will find a list of important physical, social and psychological values. Each value defines one aspect or dimension of perfection on the particular plane. Though we tend to give greater prominence in our minds to the higher ethical, psychological and spiritual values, in reality each value has total importance on its own plane. Cleanliness is as important for physical health as goodness and goodwill are to psychological and spiritual fulfillment. The power of values arises from the sincerity with which we embrace them and the meticulousness with which we express them. Though our minds tend to rank everything in order of importance related to its size, the science of life reveals that perfection in small matters can be more powerful than partial perfection in grand things. This is because perfection at any level and on any scale creates a full and complete circuit at that level and opens life to rise to the next higher level, which always results in an exponential expansion or advancement. This perfect cleanliness, orderliness and punctuality at the physical level create a conducive environment for expansion at the vital level, resulting in an unexpected influx of money or sudden social advancement or an emotionally fulfilling result. Similarly, creating a harmony at the social level -- eliminating every small incidence of sharpness, friction, conflict or tension within a family or group -- releases a tremendous power for expansion and elevation of life. These statements are the result of meticulous systematic application and observation and can be verified by every reader in his own life. We invite you to make the experiment and report back on the results. Achieving perfection at any level is very difficult and maintaining it is nearly impossible. Perfection at the psychological level brings unimagined abundance from life, creates an opening to higher and deeper knowledge, and elevates one's consciousness above the mental level. Unselfishness, selflessness and self-giving are three successive degrees of psychological progress that generate an opening to the spiritual plane. There are twelve fundamental spiritual values that form the foundation for the entire universe. Of these, Truth is one of the most powerful. Truth is the objective form of Spirit or Divinity. What is Real is true. Truth expresses ultimate Reality. Most people believe in truthfulness but in practice we compromise on many different sides. Absolute adherence to fact in thought, word and intention is a direct invocation to the Spirit. The decision to belive by Truth very often calls into play circumstances that challenge us and tempt us to recant on our commitment. The adherence to that commitment in the face of temptation opens the door to unimagined accomplishments. In this time of great complexity and hurry, there is no more important personal value than "simplicity." Taking the time to simplify anything that is highly complex is a very helpful skill in these rapidly accelerating times. Simplifying a work not only streamlines it, but makes it more effective and productive, leading to greater results when compared to its former complex arrangement. Take any important work or project in your life and come up with at least two ways to simplify it. Develop a half dozen ways to simplify your life. Harmony is the coming together of disparate elements for common purpose. It is the moving together of varied or opposing forces, so that they emerge in a higher truth that all can benefit from (not merely a compromised truth). The value of Teamwork is one variation of the value of Harmony, as is the value of Organization. Harmony is such noble and elevated a value that it can be considered a spiritual value. Make harmony a permanent personal value that you believe in and practice. Over the next few days and weeks notice points of conflict that appear in your work and life and seek to implement a higher truth, or point of view, or action in each situation that can harmonize the opposing ideas, conflicts between people, and other forms of opposition. We know the expression "don't judge a book by its cover". It means that is what is inside that is important, not the superficial surface. This expresses in a variety of ways in life. For example, any serious person will judge the truer, deeper meaning of a thing, rather than merely its outer form. A tendency to react to the outer aspect and not its intrinsic value prevents one from getting at the heart, the inherent truth of the matter, taking one away from the full knowledge that would have led to right decisions and actions, and thus great accomplishment and success in life. It is from the depths of situations and circumstances that you find its essence. For example, if one admires another's social position, instead of their true accomplishment, including the values they subscribe to, you will miss the key to their success, and therefore fail to learn from it. Or, if you are merely evaluating a person from the shallow perspective of their appearance, or quickly coming to a conclusion based on a brief acquaintance, then you also miss the deeper and wider truths behind. If you judge a book by its cover you will never get to know the depths of others, and the true meaning of life's situations. Consider various circumstances in your life where the outer or surface form is more important to you than its intrinsic content and value. Adjust your attitudes and beliefs accordingly. Perhaps the single most powerful way to succeed in life is to have more concern for our fellow human beings. Normally, we are overwhelmingly concerned about our own selves, driven by our own personal motives and ambitions. However, the happiest people literally lose themselves in the feelings, thoughts, and aspirations of others. Are you ready to "forget yourself" and be genuinely interested in the welfare of others? Are you willing to be tolerant and kind to others, listen attentively and silently to their words, be non-judgmental, and open to their opinions and points of view? If you are, you're an excellent candidate for great success in life, not to mention an ever-increasing personal happiness and joy. Try a little experiment. When you meet with others, immediately put yourself in their shoes. Think only of what they want. Listen carefully to their thoughts and feelings, and show genuine concern and empathy. Do this for the entire meeting. Now watch how the interaction goes. Watch how the energy level of the other person increases. The other individual becomes more animated and involved. In addition, if you watch closely, you may notice some interesting things starting to happen. An unthought of point of view or perspective may be raised in the conversation. New ideas or fresh new insights are suddenly revealed. Or, a new interesting idea, project or event might suddenly come out of the discussion. This all happens because you have shifted your concern towards the other person. Sometimes people don't say what they mean in order to hide something, protect themselves or someone else, or simply because they are trying to deceive in order to gain from circumstance. Do you have any of these traits? If so, why (i.e. where do they come from)? What can you do to overcome these tendencies? It is universally agreed that hard work is one of the keys to success in life and work. Without it, few can succeed. A person may not be hard working for a number of reasons -- the influence of parents, a lack of energy, a lack of motivation, a bad experience, pure laziness, etc. Consider why you may not be hard working, and then make a determined effort to change the behavior. Keep up the effort over time. Watch how life continually blossoms with good fortune! One of the most interesting values in life is one's innate desire for continuous improvement. Both individuals and organizations, such as a business, can adopt this value. For example, continuous improvement for an individual might can come in the form of a continuous urge to increase one's knowledge and skills in an area, a desire to improve one's attitudes and temperament, or a desire to do things better or get the best out of things. A company on the other hand can implement the value by continually evaluating and upgrading its procedures, the way it interacts with its customers, the way it treats its employees, and many other ways. Any value when applied can create a positive response from life. Consider this example where an individual's interest in implementing the values of continuous improvement for her company created a positive result that came out of nowhere. One of the most significant personal values is to look on every person as a special, unique individual. This form of deep respect for each person has the power of generating good will, great happiness, and great achievement. Every time you meet someone listen to their story , show and feel a great interest and respect. Also, see what unique perspective, knowledge, or insight they can offer. Then be totally responsive to their interests. Make this a regular daily habit in life. Ultimately, make this a value that you cherish. Think about four or five values that have shaped your life. If necessary, refer to the list above. Also think about specific ways you have benefited by expressing these values. Now review the list above and identify one or two additional values you would like to implement in your life. Think about the specific ways you can implement them. Then come up with a detailed action plan (using specific dates for action) to implement the values in your life. Make sure you review your plan down the line to evaluate the progress you are making so far. Make your values, including, your new values, the cornerstone of your life. Contemplate them deeply and see that they fill all aspects of your life and being.